A drawing of Americom's AAP-1 satellite. The Pentagon buys communication services on commercial satellites such as this. The Defense Department, which relies heavily on commercial satellite services to carry communications around the world, is drafting a plan to change the way it buys satellite services. A major change under consideration would have defense agencies buy commercial satellite services under longer-term contracts, according to military and industry officials. Proponents said a move to contracts of between three to five years would save money and ensure that defense agencies have enough satellite capacity when and where it is needed. Satellite services providers favor a move to long-term contracts, saying they could better plan investments and anticipate their revenue. "The biggest risk any CEO faces is the decision to buy another satellite. It's a $300 million decision," said Phil McAlister, director of Futron Corp., a telecommunications consulting and research firm in Bethesda, Md. "To mitigate that risk, you want long-term, reliable customers." 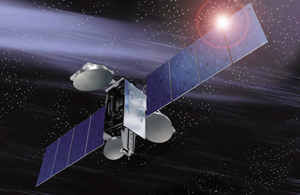 The Defense Department formed a working group this spring to consult with industry on how best to buy satellite services, according to Air Force spokeswoman Maj. Angela Billings. Members of the working group include officials from the Joint Staff, the Defense Information Systems Agency, the U.S. Strategic Command and the Office of the Assistant Secretary of Defense for Networks and Information Integration, Billings said. Peter Teets, undersecretary of the Air Force and the Defense Department's executive agent for space, formed the working group. Billings said the group's goal is "to establish a partnership with the agencies that would provide the greatest mutual benefit for DOD and industry, but with a more strategic approach to commercial satellite use to support national security needs." Billings said the group hopes to create a strategic plan by the end of 2004 for buying satellite services. "We are looking at making better use of commercial satellites, how can we get the best benefit of resources that are available," she said. Changes in the way the Defense Department buys commercial satellite services could be made within 18 months to two years, according to a DISA spokeswoman. "We are exploring a number of contract types with various terms and conditions that would significantly improve the cost and service. This dialogue within the DOD and with the contractors is continuing to evolve," the spokeswoman said. The department typically buys satellite services on what's called the spot market, under short-term contracts of a year or less. This means the department pays 20 percent to 40 percent more than it would under a two- to five-year contract, said David Cavossa, acting executive director of the Satellite Industry Association in Washington. Industry executives also said the department's buying habits may leave military purchasers scrambling when they most need satellite capacity, because that capacity may have been contracted by commercial buyers such as television networks. The Defense Department spends more than $300 million annually to lease commercial satellite services to supplement its military satellites, according to DISA, which contracts for defense satellite services. Neither government nor industry officials expect the military's demand for commercial services to decrease. Eighty-six percent of satellite services coming out of Iraq are being carried on commercial systems, Cavossa said. Commercial satellites are used to carry military communications, but not command-and-control activities that must be kept on military systems for security reasons, said Don Brown, vice president of defense services at G2 Satellite Services Co., a Washington government satellite services provider. In December 2003, the General Accounting Office recommended that the Defense Department assess its acquisition processes to see if changes are required to buy satellite services more strategically. In its report, GAO said some users of Defense Department-procured commercial satellite services think they cost too much and that the contract terms are inflexible. For example, the contracts do not allow bandwidth portability. Portability would allow Defense Department buyers to transfer unused time on one satellite to another where the time is needed, at no additional cost. The report said commercial customers are permitted this flexibility, but the Defense Department has not sought it. Industry officials said they might be willing to offer bandwidth portability in exchange for longer-term contracts. "There is a quid pro quo here," said Tom Eaton, president of G2 Satellite Solutions. "As we seek reform, the practices we use with commercial customers we would apply to the government. The best example I can point to is portability. If they bought a piece of capacity and needed to activate somewhere else, we would give them ability to do that." Some industry executives said they are optimistic that the Defense Department will change its ways. "We talk to folks at [the Office of the Secretary of Defense] maybe even weekly," said David Helfgott, president and chief executive officer of Americom Government Services Inc., a Princeton, N.J., government satellite services provider. "They are coming to the conclusion that working with industry is in their best interest. Short-term leases don't drive down price, and if you want to ensure capacity, you have to understand where you are going to need it. That leads you into longer-term leases of three to five years, not one year." "There's a heightened awareness at the Pentagon that we never had before, but at the end of the day, nothing has changed," he said. "They've been talking about this issue for more than two years now." William Woods, director of acquisition sourcing and management at GAO, said the Defense Department has taken the first steps toward improvement by reviewing its approach to buying satellite services. Next, the department should inventory its current and potential use of commercial bandwidth to get a good idea of its future needs, he said. "The department then might be in a position to consider consolidating requirements or adopting other commonly used commercial best practices," he said. "The real test, of course, will be in seeing how and to what extent these changes actually are made."